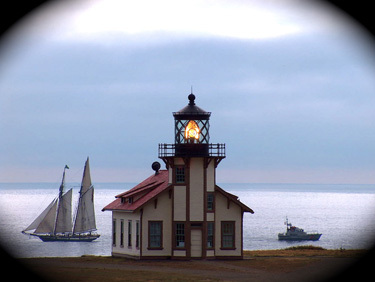 The 122-foot square topsail schooner Lynx, an interpretation of a privateer or naval schooner from the War of 1812, was at Point Cabrillo Light Station this week posing for publicity photos. Accompanied by a 47-foot motor life boat from the U.S. Coast Guard Noyo Station in Fort Bragg, the Lynx crew manuevered on calm seas back in forth behind the lighthouse May 28 for a half dozen photographers taking photos to be used to promote Point Cabrillo’s centennial planned for 2009. The Lynx is fitted with period ordnance and flies pennants and flags from the 1812 era making her one of the first ships to defend our freedom. Her crew wears period uniforms and operate the ship in keeping with the maritime traditions of early 19th Century America. 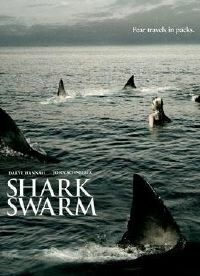 Did Anyone See Shark Swarm? Last summer, they filmed the movie Shark Swarm here in the Mendocino area. It finally aired for the first time yesterday on the Hallmark Channel, but we don’t get that channel in Mendocino. The movie stars Darryl Hannah and John Schneider. Here is a review of the movie — thanks to Debra DeGraw for the pointer. It’s pretty fun when the film crews come to town — they were shooting all around the area last year. It’s a hoot to see places you know in a movie…. I was just watching “The Russians Are Coming, The Russians Are Coming” recently, which was filmed all around the area. I even know someone who got to be an extra in the film as a young boy. Fun stuff! Check out the Chamber Visitor Center when you come up here — they have a lot of information about the many movies filmed here over the last 100 years. Just the other day, near lunch time, I was passing by the Mendocino Coast Botanical Gardens and decided to stop by for a walk to see what’s blooming. Well, everything is. You say, “of course dummy, it’s spring.” But with the new entrance that sweeps you into the garden and lush flowers everywhere, the bloom is even more dramatic than ever before. I was overwhelmed with all the colors. Check it out. A few weeks ago, I returned from the Bay Area (Walnut Creek and Lafayette) where I was shocked to find regular grade gas prices on just about every corner at $4.15 and more. On the outskirts of Petaluma I bought a tank for $4.09 and then discovered that up here on our isolated coast, Fort Bragg prices are no higher. This past week, prices hit over $4.50 in the Bay Area. I no longer shocked. It seems like high gas prices are hear to stay. For some, like the French tourist I met at a motel in Santa Rosa, U.S. prices are wonderful. Said he: “they are half the price of gas in France and here you have big roads and parking places. It’s wonderful to drive a car in the U.S. The Mendocino Film Festival is fast approaching (May 29-June 1), and once again the selection of films is top-notch. As with every successful venture, it takes a lot of people to make it happen. MendocinoFun.com would like to recognize and thank a few of the local lodging owners who have donated lodging to house invited filmmakers during the event. Agate Cove Inn in Mendocino has generously donated a 3-night stay to filmmaker Celia Carey. Celia Carey produced a very engaging film, “Mr. Dial Has Something to Say” from the Films on the Arts category about an older Black folk artist from the south who has gained national and international recognition. Agate Cove Inn is a beautiful bed & breakfast inn situated on a bluff overlooking the Pacific. It has one of the best views in Mendocino, spectacular gardens, and gracious hosts, Laraine & Roger. Coast Getaways is hosting director Jerry Rapp, his film is Mohave Phone Booth. The film tells the tale of four people in Las Vegas connected by seemingly random objects, such as a phone booth in the desert. Showing May 30 at 8 pm. Coast Getaways has vacation rentals to suit anyone’s needs – from a cottage for two to ocean view homes for families.